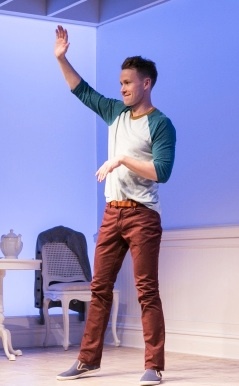 Buyer & Cellar comes to Toronto wreathed in glowing reviews from its run in New York. Experiencing it, however, makes you wonder if New York critics somehow collectively suspended their sense of judgement. The show is entertaining, but it’s also a piece of fluff that has nothing to say about anything. It also assumes that the audience is inherently intrigued rather than put off by the self-indulgent lives of the rich and famous. The show may have a gay character as its narrator but it ultimately confirms rather than challenges stereotypes. At the very start of the show Christopher J. Hanke, the actor who plays the central character Alex More, comes out to deliver a disclaimer. The show is in no way based on real events. It’s source is the 2010 book My Passion for Design written and photographed by Barbra Streisand about “the taste and style that have inspired her beautiful homes and collections” [note the plurals]. One aspect that caught playwright Jonathan Tolins’s eye has to do with Streisand’s home in Malibu. There she apparently discovered the perfect way to display all the Americana she has been collecting over the years that no longer fits into the house she lives in. Inspired by the Winterthur Museum in Delaware, Streisand created her own quaint shopping street in her basement where different parts of her collection could be displayed as if they were the wares of the various shops. Tolins thought it would be interesting to imagine what it would be like for to be hired by Streisand to work as the cleaner/shopkeeper for this private shopping mall. Tolins therefore presents us with out-of-work actor in Los Angeles, Alex More, who has just been fired from his latest job, this time playing a cartoon character at Disneyland or “Mauschwitz” as he calls it. Tolins creates some tension by having Alex answer an advert to work as a shopkeeper for a private employer without ever knowing who this employer is. Alex is amazed to see his employer’s Norman Rockwell-like recreation of an idyllic midwestern farm with working mill. The best part of the show involves Streisand’s visits to her private mall, pretending to be someone else, and attempting to buy one of her own antique objets from Alex the shopkeeper. Alex decides to play his role and to pretend he doesn’t recognize Streisand and sets a price on the objet that she thinks is too high. Once this episode of overt mind games between employer and employee is over and Streisand begins to use Alex as a confidant, the show becomes both more sentimental and even less believable. At the start of the show Alex claims that he is not like other gay guys and does not have an “inner diva”, i.e. a female singer to identify with who can express on a larger scale the emotions that he as a private individual cannot. We think that is just as well since the whole concept of “inner diva” is as old-fashioned as gays who call themselves “Friends of Dorothy”. It comes from a time when gay men had only female singers to identify with since there were no publicly out male singers. It also assumes that popular culture is only arena where gay men find any profundity. Alex says that he had no feelings positive or negative about Streisand before he took the job. The point of the action is to change that position. Alex’s boyfriend Barry (also played by Hanke) thinks the whole situation Alex has got himself into is outrageous. Why should he spend all his working hours underground catering to the fantasies of some woman who is so wealthy she is like a modern equivalent of Marie Antoinette, who used to pretend she was a shepherdess on her own little toy farm at Versailles? By creating the character of Barry, Tolins gets to present two sides of his material, presumably to appeal to both pro- and anti-Streisand factions in the audience. Alex becomes more drawn into Streisand’s world and begins to think that the poverty of her humble origins in Brooklyn somehow justifies her present excessive mania for collecting. Barry simultaneously points out that lots of people have humble origins and yet have not been driven to Streisand’s excesses. Tolins has us discount Barry’s opinions in two ways. First, Alex is played as if he were an eternal teenager not unlike Sean Hayes’ Jack on Will and Grace. Barry, however, is not a more straight-acting Will to Alex’s Jack, but bitchier and more effeminate. Tolins has Alex disregard Barry’s views as the product of his negative personality and of envy. Second, Tolins has Alex discard Barry entirely when Barry thinks Alex has become too involved with his bizarre employer. We are supposed to see Alex’s breaking up with Barry as a good thing whereas it actually means that a voice critical of the situation is cut out of the play. While Tolins presents Streisand (also played by Hanke) as every bit as controlling, self-centred and materialistic as Barry says she is, the play ends with Alex emulating Streisand-like behaviour and we’re are supposed to applaud this as a triumph. Tolins’ play is thus conservative in that he shows Alex finally discovering his inner diva, outdated as that is, besides admiring the behaviour of the super-rich. acknowledged. Admiration of the wealthy has roots that go back to the very beginning of American history, yet in the US of the present where the wealthiest 1% own more wealth than the bottom 90%, there is something more disturbing than amusing about watching a play focussed on the eccentricities that extreme wealth makes possible. Hanke is quite likeable as Alex although it is embarrassing to see a 38-year-old express himself in ways more often seen in teenaged girls. For “Oops, I said the wrong thing!”, he puts his elbows out and covers his mouth with his hands, fingers splayed. For “Ooh, that’s weird!” he puts his head to one side, grimaces with eyebrows way up. Hanke recurs to the same few gestures far too often and his overall boyishness, while initially fun, gradually become wearing. We start to see why Alex is unemployed as an actor. He can’t seem to play mature. Hanke’s impression of Streisand is peculiar but we gradually come to accept it. Although the 70-year-old is no crone, Hanke plays her bent over at the waist and talking in a low Brooklyn accent with her head parallel to the ground. Only in Streisand’s embittered personal assistant and in a guest appearance of the super-manly James Brolin, does Hanke get to show the range of his acting talent. Though the show is not billed as if it were geared only to Streisand fans, the more you know about Streisand the more likely you are to get the innumerable unglossed allusions to her scattered through the play. You have to know who Jason is, no last name or anything. (He’s Streisand’s gay son by Elliott Gould.) You need to know plot points of films Streisand was in like Funny Girl (1968), The Way We Were (1973), The Prince of Tides (1991) and Meet the Fockers (2004). And you have to have a good working knowledge of The Mirror Has Two Faces (1996) in order to understand what is so humorous about Barry’s lengthy analysis of it. At least Tolins provides a gloss about the non-Streisand film Capricorn One (1978), a movie that happened to star Streisand’s first and second husbands. Given that the story of Alex More is entirely fictional, this kind of trivia – about Streisand’s life, her house, her collections, her movies – seems to be what the show is really about. Tolins’ fantasy is amusing but totally lacking in substance. If that’s what you look for in an evening out, this show is for you. Photo: (from top) Christopher J. Hanke, ©2014 Joan Marcus; Christopher J. Hanke, ©2013 Kevin Thomas Garcia.